Planed and joined sycamore back and sides; planed and joined pine soundboard; rosette inlaid with rose and ivory, with penwork scrolls; finial inlaid with ebony and ivory; ebony fingerboard with brass frets. The English guitar was derived from the cittern, a wire-strung instrument, and was widely played by fashionable ladies in the British Isles from about 1750 until 1810. 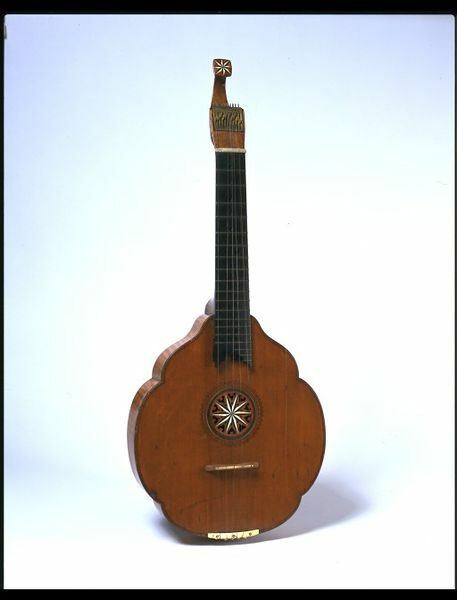 This example has six courses (four of double and two of single metal strings), tuned in the key of C. It was constructed by Remerius Liessem (active, 1750-1760) of London, who also made violins and 'cellos. This instrument was made in 1756 and is one of the earliest dated examples fitted with a 'watch-key' device. The player would turn small metal tuning pins with a watch-key, and these helped to make tuning more stable. "Festooned model. Two-piece back of sycamore. The belly has purlfing lines simulated in ink, and an inset rose inlaid with a star of ivory and ebony surrounded by penwork scrolls. Normal loose bridge. The ebony fingerboard, very slightly curved, has sixteen full brass frets and three short, also five holes for attachment of a capotasto. The head has a square finial with a star pattern inlay as on the rose, and brass screw-tuning (by separate watch-key, now missing). Four double courses of steel and brass, two single of overspun brass." - Anthony Baines: Catalogue of Musical Instruments in the Victoria and Albert Museum - Part II: Non-keyboard instruments (London, 1998), p. 49. Remerius Liessem made this in London 1756. Label in ink on the inside of the instrument. 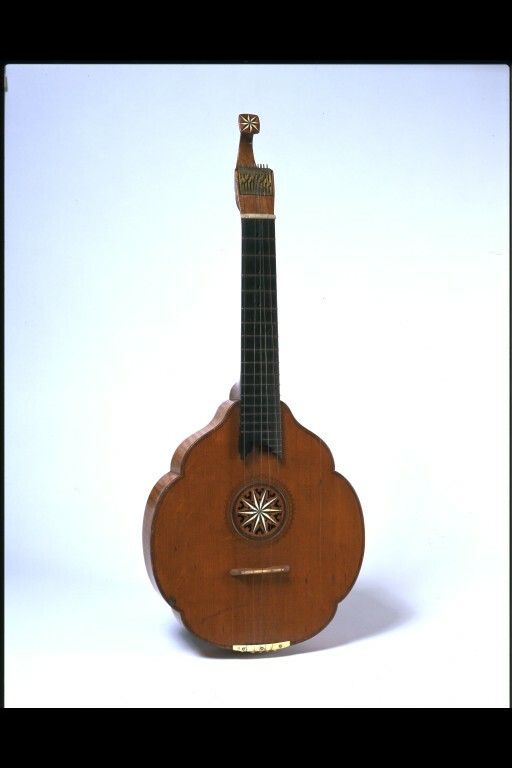 This instrument formed part of the collections of Carl Engel (1818-1882) and was purchased by the museum in 1882 for £1 - 5 - 0 (£1.25p). 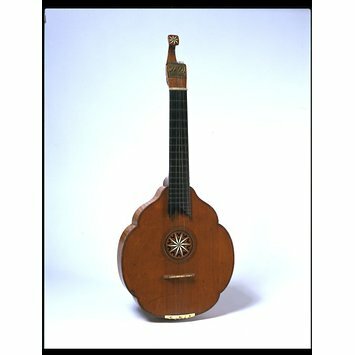 English guitar, sycamore body, Remerius Liessem, London, English, 1756.